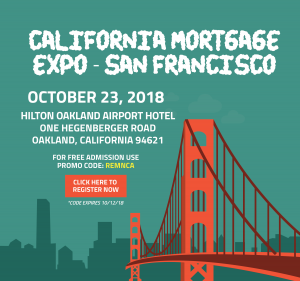 We’re excited about California Mortgage Expo being held October 23, at the Hilton Oakland Airport in Oakland, CA. We’ll be there — and we hope you’ll come as our guest by using promo code “REMNCA”. That’s a savings of $125 off the regular registration rate, per person. Stop by Booth #180 to get all your lending questions answered on the spot by the REMN team! See you in Las Vegas. 203(k) loans aren’t the challenging and time-consuming files that they are rumored to be. 2018 is a very different year, and to compete you’ll need an edge. 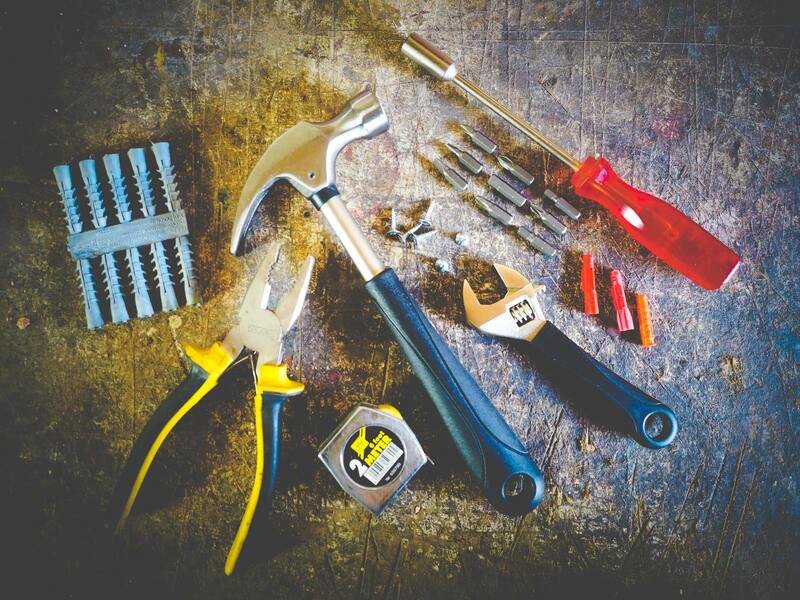 Renovation lending, particularly the FHA 203(k) loan can be that edge. During this session, we will clear the air and help you understand how to take advantage of 203(k)s.
* What are 203( k) loans and how do they work? * Why do they take so long to close? * 203(k) loans aren’t Realtor friendly, are they? * Aren’t most property sellers against 203(k)s? * Aren’t 203(k) loans impossible to close? Let’s discuss how great 203(k) loans are, how quickly and reliably they can be closed, and how Realtor friendly they are! Space is limited to the first 500 registrants. To secure your spot please visit => http://tiny.cc/203kdecoded. 2018 has certainly presented loan officers with a difficult challenge. The challenge itself is to adapt. If you adapt you will survive, if not, the consequences are literally the opposite of survival. Luckily REMN Wholesale has your back. 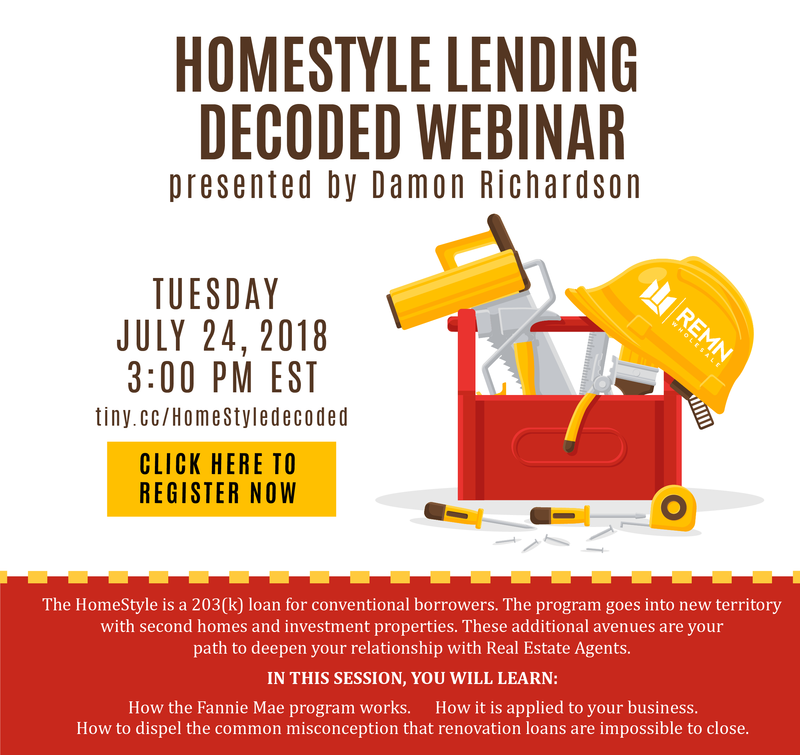 This webinar presented by Renovation Lending Specialist, Damon Richardson is a tutorial on adapting to the world of real estate purchases utilizing renovation. ‘Why renovation,’ you ask? To say it simply, renovation is the key to your salvation. • Become a solution to the common market problems real estate agents face daily. These three keys will bring you back to profitability, and they are all made possible through renovation. Registration limited to the first 500 registrants. Follow this link to secure spot => http://tiny.cc/REMNRenoSalvation. The HomeStyle is a 203(k) loan for conventional borrowers. The program goes into new territory with second homes and investment properties. These additional avenues are your path to deepen your relationship with Real Estate Agents. • and finally, Damon will dispel the common misconception that renovation loans are impossible to close. Space is limited to the first 500 registrants. To secure your spot please visit => http://tiny.cc/HomeStyledecoded. Finally, VA Renovation is Here! Veterans now have the ability to buy and renovate with one loan! 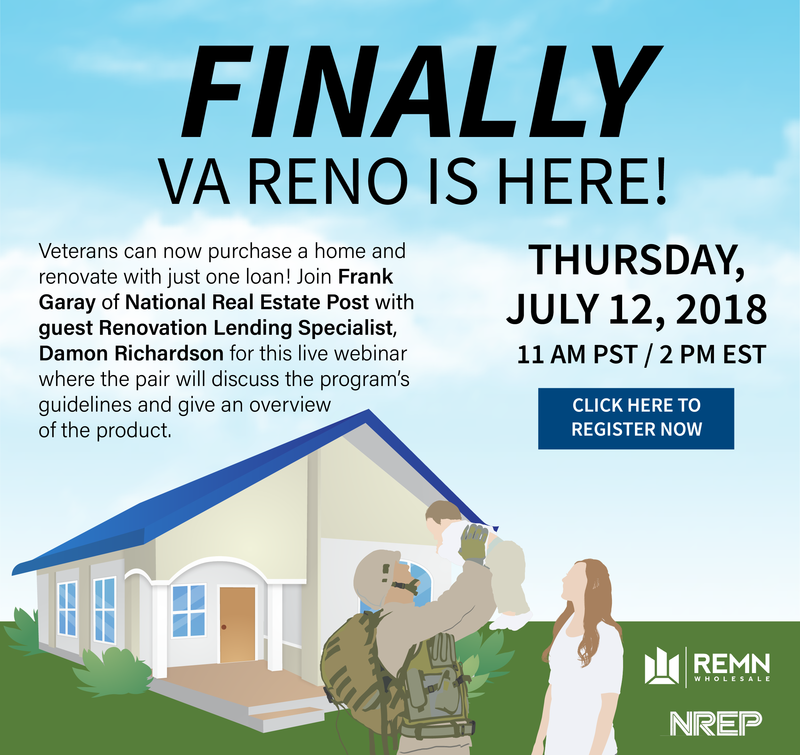 Join Frank Garay of National Real Estate Post with guest Renovation Lending Specialist, Damon Richardson for this webinar the pair will discuss the program’s guidelines and more. Registration is extremely limited! Secure your spot now by visiting www.tiny.cc/REMNVARENO. Sell more loans by teaching your clients to combat the affordability crisis! 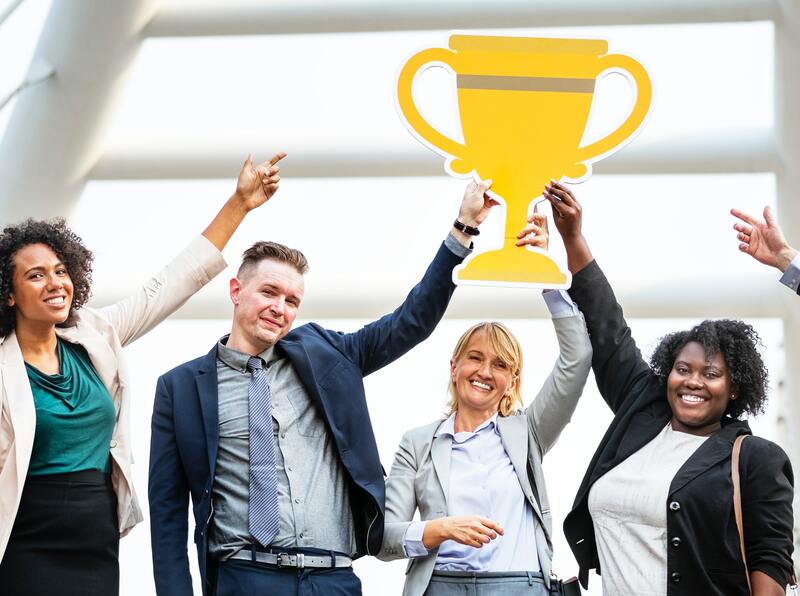 Join industry veteran Steve Marshall during this topical webinar, and discover the keys to success in a rising rate environment. 3. How to think outside the box with HomeReady. Registration is limited to the first 500 registrants! To register please visit => https://register.gotowebinar.com/register/6276978133666729730. ▪ Selling reno loans to millennials! 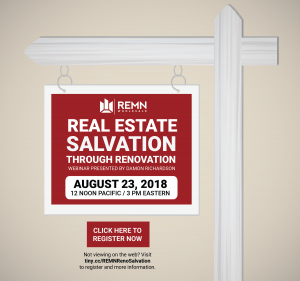 ▪ How will renovation lending unlock more opportunities and generate additional revenue and more referrals? REMN Wholesale held a webinar on the new FHA guideline changes that will take place with case assignments on and after September 14, 2015. This important webinar we reviewed the new FHA guidelines that may impact your borrowers’ ability to secure mortgage financing.